Understanding the Record Link field type. The record linking field allows you to link records from separate apps together. The records in the linked app can be used for many use cases, but a primary use case is to use this field type for lookup table functionality. The record link field has a few options that are not found in other field types. Below is an explanation or link to the dedicated pages for these settings. Allow creating new records - When enabled this will allow the user to create new records in the app that is linked to the record link field. Select existing records: When enabled this will allow the user to select existing records from the app linked in the record link field. Updating existing records: When enabled this will allow the user to update data in existing records in the app linked to the record link field. Link multiple records: When enabled this will allow the user to select multiple records to link from the app linked to the record link field. Record link fields also have the ability to filter the options presented to the user. For more information on this please check out the selection filters page. 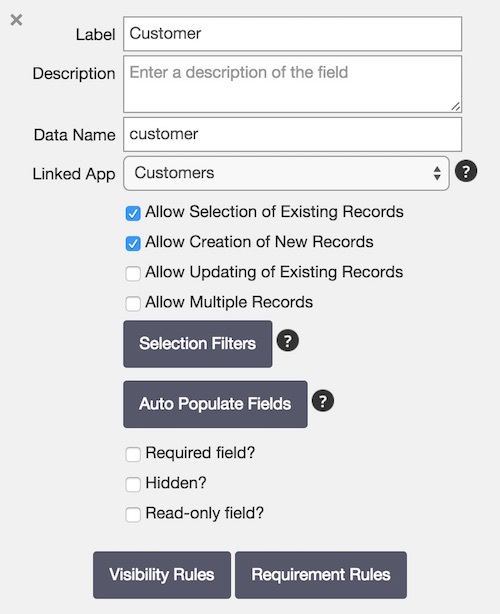 Record link fields also have the ability to pull in values from fields in the linked record and automatically populate fields in the record with the record link field. For more information on this please check out the auto-populate field page. You have the ability to hide the linked app on the mobile devices, doing so will only allow the field user to access the linked app though the record link field in the app with the field. This will ensure that the linked app is only every accessed for its intended purpose. For information on what exported data looks like for apps that have a record link field please check out the managing record linked exports page. In order for plan members to link records from another app, they will need to be given permission to both the app that has the record link field and the app that is being referenced by the record link field. The picklist for a record link field uses the record title schema of the linked app. If you wish to change what is presented in the record link field's picklist, you will what to alter the record title of the linked app.